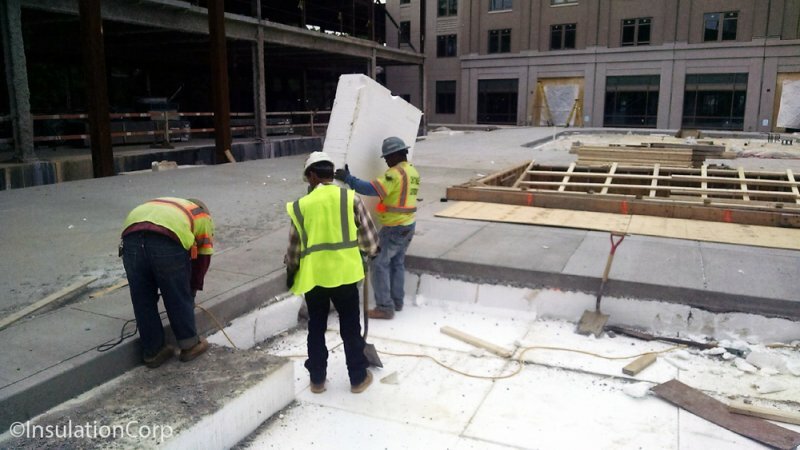 Engineers that are familiar with EPS Geofoam are seeing the “lite” and discovering that EPS has many cost effective uses at construction sites. ICA tagged EPS, expanded polystyrene, as the Extraordinary Product Solution and boasts about the thousands of applications for our product. 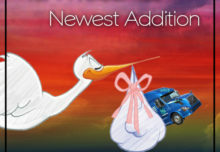 We love when new ideas present themselves! 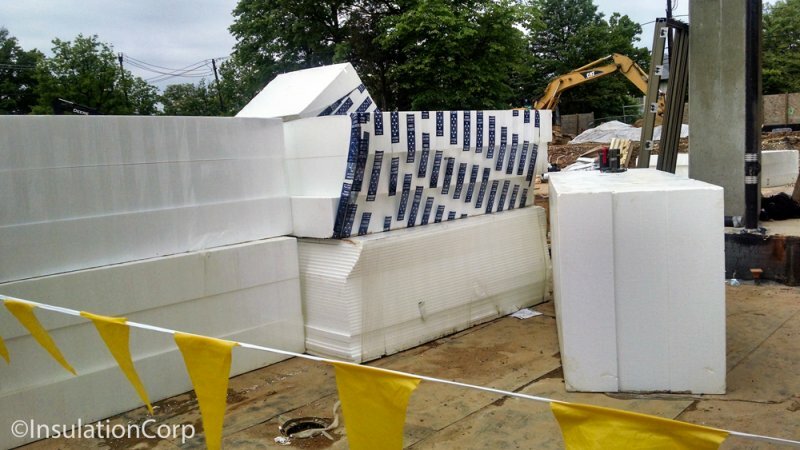 At first glance of these pictures, it looks like the Geofoam is being removed…and in fact, that is exactly what they are doing. 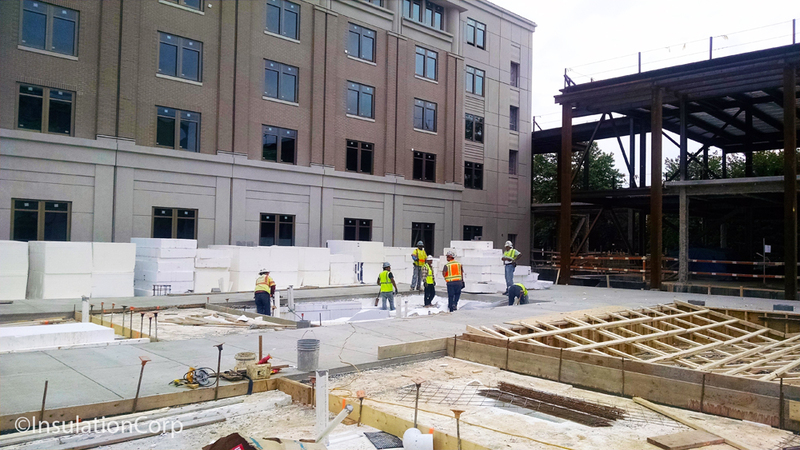 At the American University in Washington, DC, ICA-Geofoam was actually specified for a staging area of the plaza that will connect the two dorms. In the process of construction, there were two levels of elevation that created a safety risk. 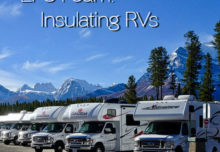 The contractor researched pricing and discovered it would be more cost effective to install EPS Geofoam to make it level rather than install construction fencing. 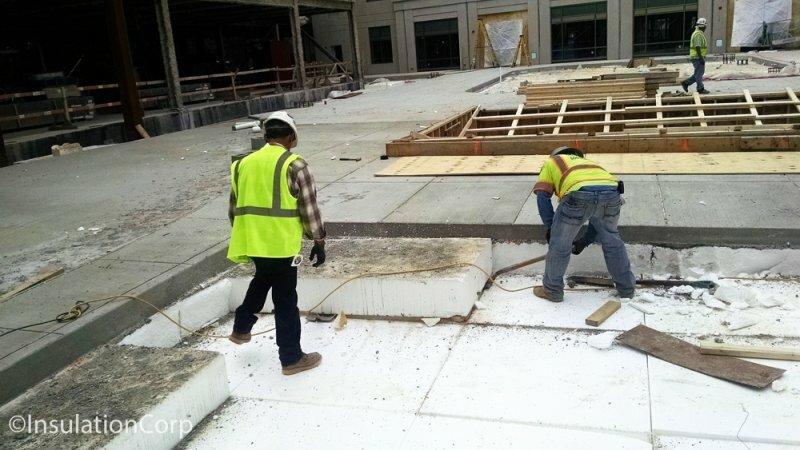 Yes, it cost less to install and remove the Geofoam than to install temporary construction fencing! Prominent words for construction are time and cost, the exact two things that specifying EPS for your project will save you. The staged EPS was then used to finish up the grade on this rooftop for a lightweight solution. 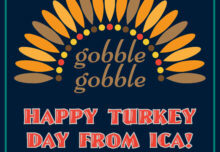 A brilliant and environmentally conscious idea! 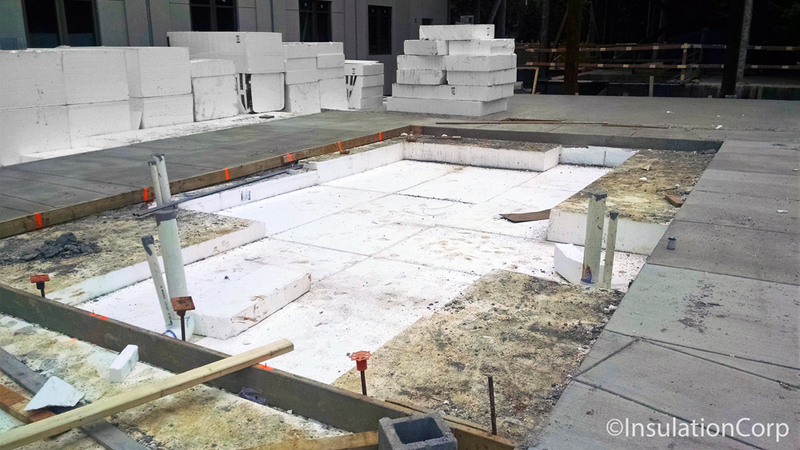 The comparisons of the weight of EPS Geofoam versus soil are vast. 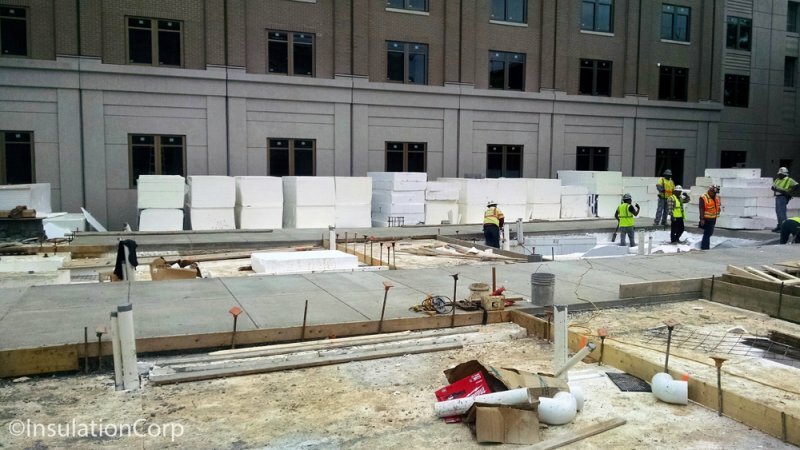 Geofoam is approximately .7 to 2.85 pounds/cubic foot (depending on product type) compared to soil at 110 – 120 pounds/cubic foot. 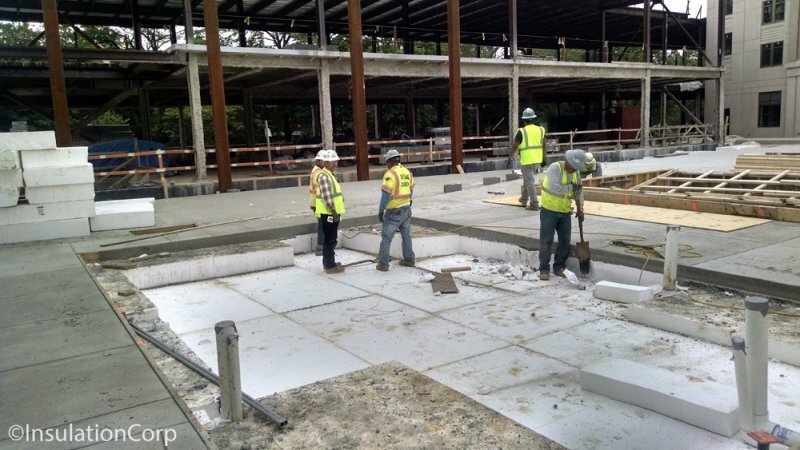 This alone makes EPS the perfect product solution for rooftop gardens and plazas, skate parks, and even swimming pools. From center stage as theater props to staging construction sites, EPS is indeed the Extraordinary Product Solution. Where can you see the “LITE”? 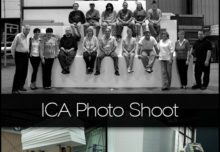 How can ICA-Geofoam/ICA-EPS fit into your next project?